Why did so many distinguished Western Intellectuals�from G.B. Shaw to J.P. Sartre, and. closer to home, from Edmund Wilson to Susan Sontag� admire various communist systems, often in their most repressive historical phases? How could Stalin's Soviet Union, Mao's China, or Castro's Cuba appear at one time as both successful modernizing societies and the fulfillments of the boldest dreams of social justice? Why, at the same time, had these intellectuals so mercilessly judged and rejected their own Western, liberal cultures? What Impulses and beliefs prompted them to seek the realization of their ideals in distant, poorly known lands? How do their journeys fit into long-standing Western traditions of looking for new meaning In the non-Western world?These are some of the questions Paul Hollander sought to answer In his massive study that covers much of our century. His success is attested by the fact that the phrase "political pilgrim" has become a part of intellectual discourse. 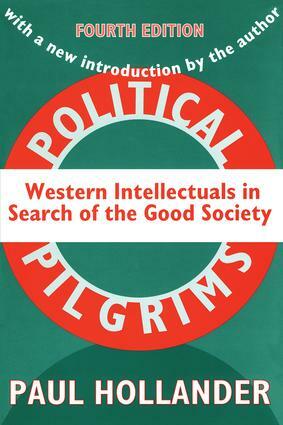 Even in the post-communist era the questions raised by this book remain relevant as many Western, and especially American intellectuals seek to come to terms with a world which offers few models of secular fulfillment and has tarnished the reputation of political Utopias. His new and lengthy introduction updates the pilgrimages and examines current attempts to find substitutes for the emotional and political energy that used to be invested in them.